Psalm thirty-nine is encouraging us to be in right relationship with God. 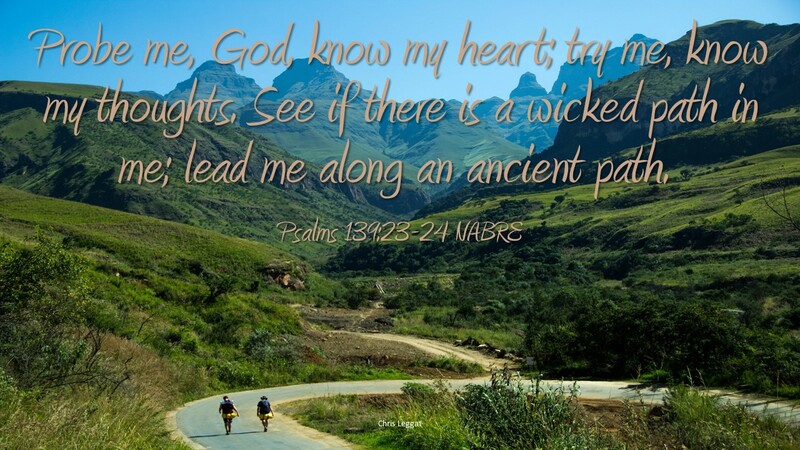 The psalm opens declaring God knows us very well. God knows our actions, locations, thoughts, words, ways and motives. God knows us perfectly. There is no place we can go that God cannot be with us. In fact God wants to walk with us always, to guide us, to share His plan for us. God made us with a special purpose, God is present at our conception and birth. We are made in God’s image. God also has a plan for our life, a plan that comes from His heart and is the very best for us. Our life is a pilgrimage which God has prepared, our responsibility is to be with Him daily, ponder His Word and walk in the Spirit. There are those against God, people who fall into wicked ways, sinners whom God grieves. We want God to search us and root out anything wicked within us. We want to be always open to God’s Word and His Spirit, so God may speak to us and we discover his truth. We have the freedom to choose the life we want and we also can have the best life possible by discovering God’s plan for our life. God knows us best. He knows our gifts and our abilities, and He knows where we can be our best. We should spend time every day in God’s Word, learning about God and discovering how to listen to His message and plan for our life. We should also be open to the Spirit, free to be led, even to places we never thought we would go. Often it is in the place we didn’t expect to be that we discover God’s purpose for our life. How do you spend time with God? What is your daily plan to let God and His Spirit guide you throughout your day?